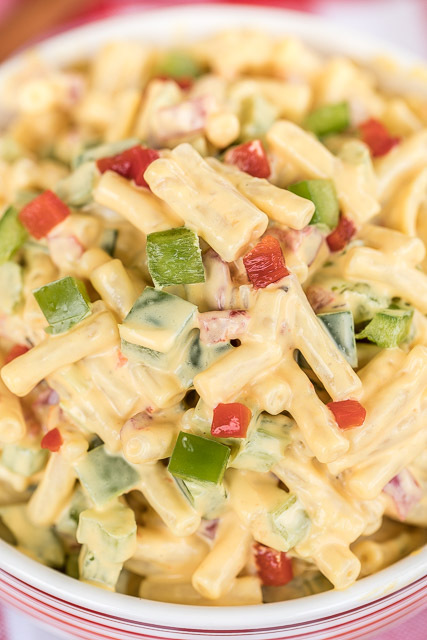 Transform a box of mac & cheese into the most delicious pasta salad EVER!!! Mac and Cheese mix, mayonnaise, celery, green bell pepper, green onions and pimentos. Seriously delicious! I took this to a potluck and everyone gobbled it up. Nobody could believe that it started with a blue box of mac & cheese! Give this a try ASAP! This recipe came from my Mom. She found it one of her cookbooks and sent me the recipe. She said that Plain Chicken readers needed this recipe! 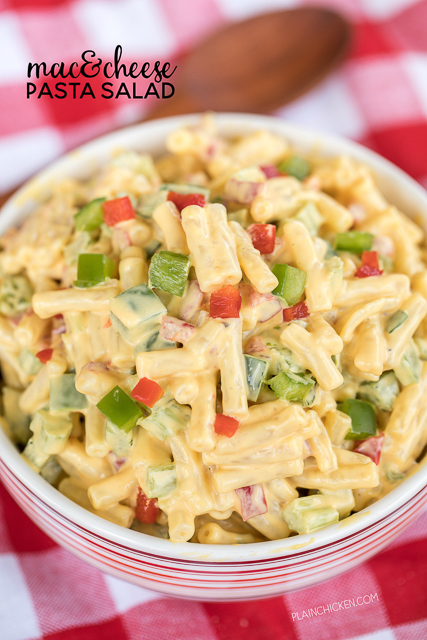 This Mac & Cheese Pasta Salad starts with a box of Kraft Macaroni and Cheese. I know what you are thinking. I was thinking it too, BUT this is really, really good! We were both shocked at how delicious this Mac & Cheese Pasta Salad tasted. 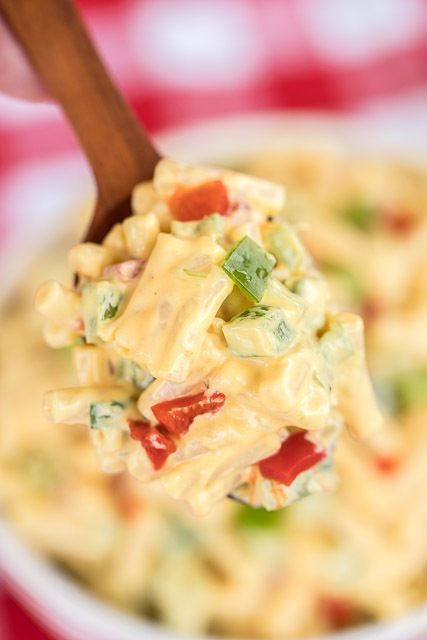 This Mac & Cheese Pasta Salad is super easy to make and would be great for any upcoming tailgates or Labor Day cookouts. You can make this a day in advance and refrigerate the pasta salad until you are ready to serve. I promise this will be the first thing to go! It is crazy good!!! We ate this with lunch two days in a row. Who knew that a childhood favorite could be transformed into the BEST pasta salad EVER! Boil macaroni as directed on package. Drain and rinse with cold water. Set aside. Combine contents of cheese packet, mayonnaise, celery, green bell pepper, green onions, pimentos, salt and pepper. Toss pasta with mayonnaise mixture. Kraft Original Mac & Cheese with dry (powdered) cheese packet or the delux with the liquid cheese packet? Ragu double cheese sauce and elbow noodles, much better. Did you use the Ragu Cheese Sauce for mac and cheese or for this salad with the vegies added? I made this for my family reunion. The celery seemed to take it over and I do like celery. Next time, I will use less celery or add another box of macaroni and cheese. Great otherwise. I liked it. Am making it again this week for a dinner. Husband said it had the right amount of "crunch."